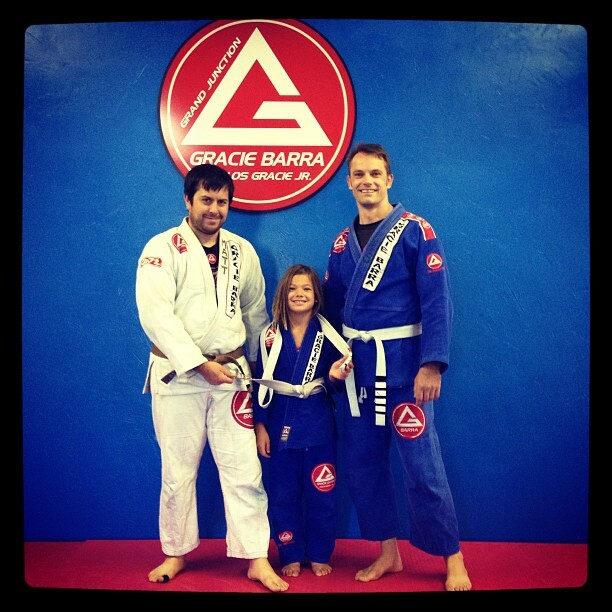 This past weekend my little girl Shilo had her first belt test in Brazilian Jiu Jitsu. She’s been really dedicated to it for the last 6 months and has picked it up really quickly. Plus we have a lot of fun “wrassle frassling” with each other as we practice at home. In BJJ you actually have to show that you know a few things to earn your next level belt, which I think is really cool in a world of McDojo’s that give out stripes at every class and hand out belts for just showing up. They’re not fanatical about things being perfect but the kids do need to show that they’ve paid attention and can apply some basic techniques. To prepare we practiced every day of the week leading up to her test. She didn’t want to practice some days and I’m ashamed to admit I bribed her with a popsicle once but she logged the focused practice time to learn the test. Now, I don’t mean to brag but all that practice paid off and she nailed the test. She ended up testing by herself as the whole class watched and she never flinched, going through the techniques before the coach was even done explaining what to do in some cases. She was done quickly and showed a lot of confidence during the test thanks to how well she knew it. Focused practice can be a grind but it is needed to be great. In fact, that was the question I asked Shilo before we decided to practice every day – do you want to be average or do you want to be great? Like a lot of people she answered “great” but found it tough to stick to it once the initial fun factor wore off and the grind set in. Luckily she had me to help keep her motivated in various ways but we don’t have a parent telling us what to do for our own good anymore. This means we have to rely on ourselves and our own internal motivation. For me, just knowing that it is normal to not find every training session a super fun experience helps a lot. I think we get brainwashed with the whole “do what you want/ makes you feel good” mentality into thinking that if it isn’t fun it isn’t worth doing. It also helps to know that it isn’t the most people with the most talent for a sport that end up being great, it is the people with the best talent for practicing that sport. Being able to find the mindset that will get you through the grind is what guarantees your success in anything. So don’t be afraid of the grind and learn to embrace it. Everyone who has achieved any lasting success will tell you that it pays off big time over the long run. Just knowing that you need to do this one simple thing will put you on the right path to achieving your goals. Thanks, appreciate that. Being a dad is my #1 job and if you don’t make an effort it won’t just happen. Staying focussed is the ultimate life challenge. Way to go Shilo! Thanks for sharing coach.